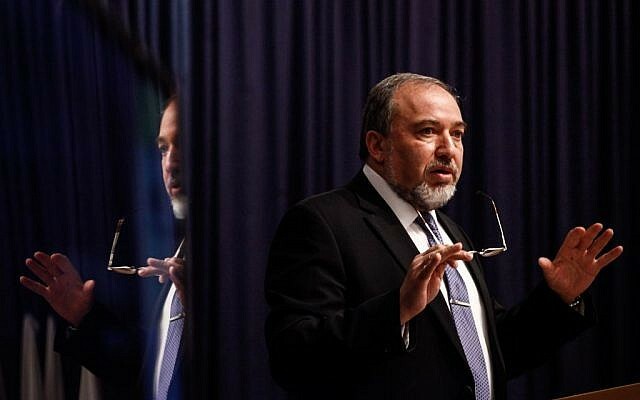 Liberman emphasized that he supports the creation of a Palestinian state and appreciates the current efforts of US Secretary of State John Kerry to reach a final status deal, but added that he would not agree to an agreement that would allow “even one” Palestinian refugee to return to Israel. He also suggested that Kerry’s positions on the peace process, including his understanding of Israel’s security needs and its demand to be recognized as a Jewish state, were the best offer Israel could expect from the international community. “Any alternative proposals brought forward by the international community will suit us much less,” he said. Liberman spoke at the opening of the Foreign Ministry’s Ambassadors Conference for heads of Israeli missions across the world. At the conference, which took place at the Foreign Ministry headquarters building in Jerusalem, Liberman sounded decidedly less hawkish than in recent years. The foreign minister who has insisted in the past that a peace agreement with the Palestinian Authority was unattainable and accused PA President Mahmoud Abbas of “political terrorism,” on Sunday sounded as if he accepted the idea that a Palestinian state will be created in the near future. The redrawing of Israel’s borders to exclude major Arab population centers that lie on the Israeli side of the Green Line, and which are populated by longtime Israeli citizens, has long been Liberman’s policy. In the past, Prime Minister Benjamin Netanyahu has rejected this approach. The area known as “the triangle,” located in the Sharon plain, contains mostly Arab-populated towns and cities such as Kafr Qara, Umm al-Fahm, Tayibe and Qalansawe. It was to have come under Jordanian rule in the arrangements that saw the establishment of the State of Israel but was ultimately included in Israeli sovereign territory under the 1949 armistice agreements because of Israeli security demands. Israel instead ceded territory that had been earmarked for Israeli sovereignty in the area of the southern Hebron hills. Last week, unnamed sources told Maariv that the “triangle” plan, involving some 300,000 Israeli Arabs living on land that would become part of a new Palestine, had come up during talks between Israel and US officials at various levels, including at least one occasion when very senior officials, Kerry among them, were in attendance. Israeli legal officials have begun investigating legal aspects of such an arrangement, the newspaper said. It added that the Americans have apparently not assented to the idea, and that the Palestinians are likely to reject it. The idea is aimed at addressing two central issues in a possible peace agreement: first, land swaps between Israel and a Palestinian state that would enable Israel to expand its sovereignty to encompass major West Bank settlements, while compensating the Palestinians with territory that is currently part of sovereign Israel; and second, preserving Israel’s Jewish majority. It was important to look at the day after the signing of a possible peace agreement, Liberman said. “It is important [to know] if we can live with the pressure that will be exerted on us, from outside and from within. Will a signature on the agreement with the Palestinians bring about an end to pressure on Israel from international community, or instead of so-called settlements, will those who criticize us over the settlements find something else to pressure us about?” Liberman said. Earlier in this speech, Liberman praised Kerry for his efforts to bring Israelis and Palestinians to sign a final status deal, and said that there was value in the negotiations even if they did not lead to a deal. While he said that Israel needs to look for other partners across the globe, Jerusalem’s relations with the United States are the “cornerstone” of Israel’s foreign policy. Stuart Winer contributed to this report.